Last weekend Ben and I planned a last-minute stay in Cardiff. Since we didn't plan it far in advance we didn't really have any ideas of what we'd do, but it was actually fantastic. On the Saturday we decided to head to the Doctor Who Experience. Since we passed the Millennium Centre on the way we decided to pop inside (mainly out of curiosity), and managed to book tickets to see a performance of West Side Story the same evening. 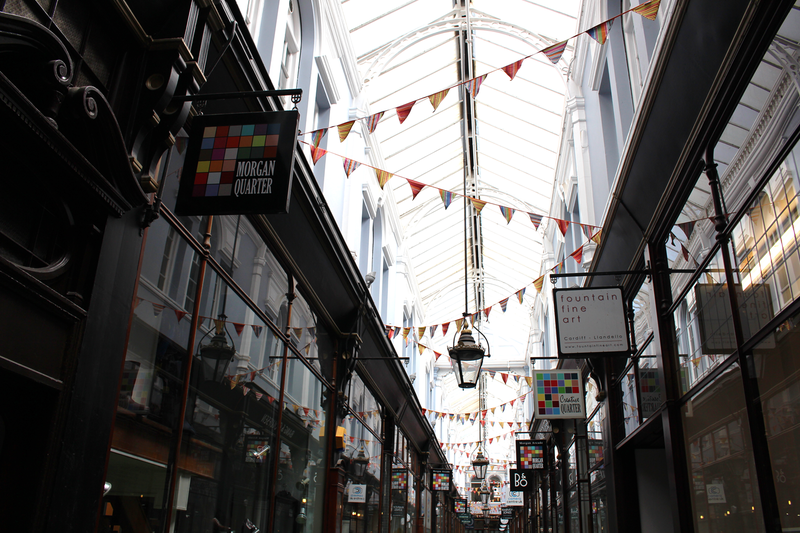 On Sunday we decided to explore the shops and stumbled across some amazing arcades. We were then thinking about heading home when we spotted Cardiff Castle and found that there was a special Medieval event on. We were so lucky! Turns out that spontaneous trips are the way to go. I was lucky enough to get my new camera recently, and I loved putting it to good use. I really hope you can see a difference in my photos - I'm so impressed with it! Ben's hot chocolate "mug" that was really a bowl. Ben and I put together some LEGO mini figures. They're not an exact resemblance, but for £3 we couldn't complain! The view from our giant business class room window. Hooray for complimentary upgrades! Wall art at the Doctor Who Experience. My least favourite Dr Who villains. So creepy. The theatre in the Millennium Centre was amazing. West Side Story was also good once you got used to the strong accents! There were these unusual shopping arcades everywhere. Need to go back to explore some more! The Keep at Cardiff Castle. Since there was a Medieval weekend going on at the Castle there was also a Falconry display. We got the chance to hold this grumpy guy - Mr G, the Little Owl. The Gold and Blue Knights fighting valiantly. The stained glass windows in the House were pretty amazing. As were the ornate ceilings. And to finish off with: my current favourite nail varnish (Angel Kiss by Color Club). Every time I step outside I find myself mesmerised by the holographic effect. So shiny! Have you ever booked a weekend away with no idea what you'd do? How did it turn out? These pictures are so nice to watch and it looks like you both had an amazing time. Great post and keep up the good work.